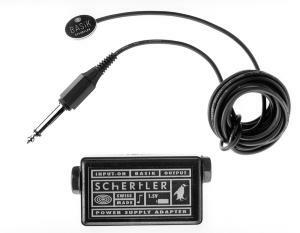 A new contact transducer pick-up for harps and all other acoustic stringed instruments. Attach the pick-up using the special inert putty supplied and BASIK will convey the body vibrations with high precision producing a natural acoustic sound. With the BASIK-SET, the microphone can be plugged in any amplifier through the phantom power adapter box supplied with a 1.5V AAA battery.